The next leg up for Gold is officially here. And it’s going to be the big one. 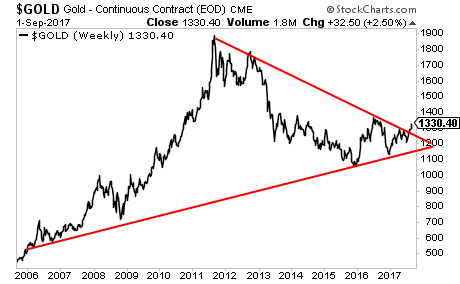 Gold has broken out of the mother of all triangle patterns established by the long-term bull market trendline established in 2006 and its seven-year descending line from the 2010 peak. Of course, things won’t be moving in a straight line from here. But the upside target for this formation is well north of $3,000 in the next few years (again, remember this formation took over a decade to form). But the picture is crystal clear. We get confirmation of this from the Gold Miners to Gold ratio (GDX: GLD). Think of this as a measure of Gold beta as Gold Miners typically lead the precious metal during major moves. 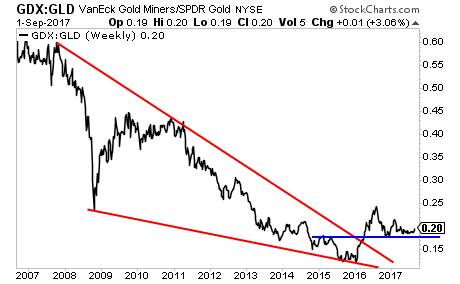 With that in mind, consider that the Gold Miners to Gold ratio has broken out of a bullish falling wedge pattern running back in 2007. This is MASSIVELY bullish and predicts the ratio moving to 0.45. Put another way, Gold is going to be moving sharply higher. And Gold Miners are going to be going through the ROOF. This formation predicts Gold well north of $3,000 with Gold Miners at new highs for this bull market. If you’re not taking steps to actively profit from this, it’s time to get a move on. We just published a Special Investment Report concerning a secret back-door play on Gold that gives you access to 25 million ounces of Gold that the market is currently valuing at just $273 per ounce. We are giving away just 100 copies for FREE to the public. As I write this, there are 49 left. 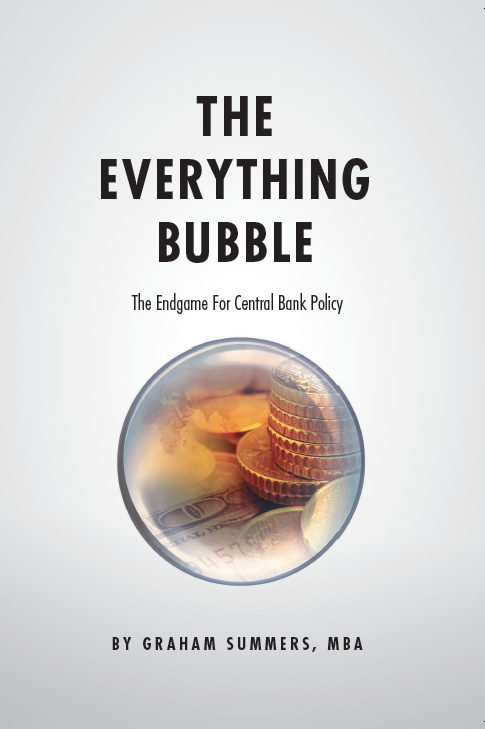 Is the Fed About to Burst Its Third Bubble? Pick Up Graham’s Bestselling Book Today! Subscribe to Gains Pains & Capital!! And we'll send you three investment reports (a $99 value) FREE! Sign up to receive our daily market commentary and receive a FREE three hard hitting investment reports today! Gains Pains & Capital Copyright © 2019. Disclaimer: The information contained on this website is for marketing purposes only. Nothing contained in this website is intended to be, nor shall it be construed as, investment advice by Phoenix Capital Research or any of its affiliates, nor is it to be relied upon in making any investment or other decision. Neither the information nor any opinion expressed on this website constitutes and offer to buy or sell any security or instrument or participate in any particular trading strategy. The information in the newsletter is not a complete description of the securities, markets or developments discussed. Information and opinions regarding individual securities do not mean that a security is recommended or suitable for a particular investor. Prior to making any investment decision, you are advised to consult with your broker, investment advisor or other appropriate tax or financial professional to determine the suitability of any investment. Opinions and estimates expressed on this website constitute Phoenix Capital Research's judgment as of the date appearing on the opinion or estimate and are subject to change without notice. This information may not reflect events occurring after the date or time of publication. Phoenix Capital Research is not obligated to continue to offer information or opinions regarding any security, instrument or service. Information has been obtained from sources considered reliable, but its accuracy and completeness are not guaranteed. Phoenix Capital Research and its officers, directors, employees, agents and/or affiliates may have executed, or may in the future execute, transactions in any of the securities or derivatives of any securities discussed on this email. Past performance is not necessarily a guide to future performance and is no guarantee of future results. Securities products are not FDIC insured, are not guaranteed by any bank and involve investment risk, including possible loss of entire value. Phoenix Capital Research, OmniSans Publishing LLC and Graham Summers shall not be responsible or have any liability for investment decisions based upon, or the results obtained from, the information provided. Phoenix Capital Research is not responsible for the content of other websites or emails to which this one may be linked and reserves the right to remove such links. OmniSans Publishing LLC and the Phoenix Capital Research Logo are registered trademarks of Phoenix Capital Research. 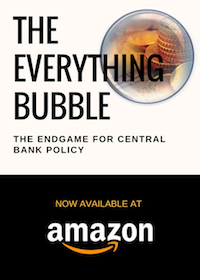 Phoenix Capital Management, Inc.
What Happens When the Everything Bubble Bursts? To prepare for what's coming down the pike!